Azodyl is a nutritional supplement that reduces azotemia (an increased concentration of compounds that impair the kidneys ability to filter and eliminate waste) in cats and dogs. 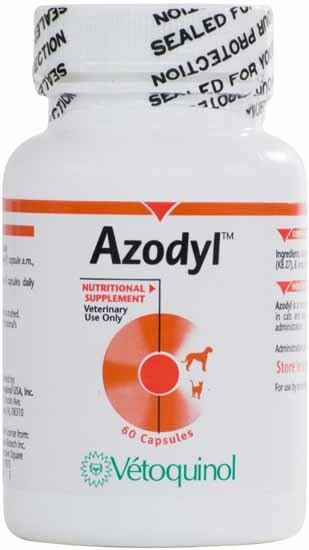 Azodyl is a nutritional supplement that reduces azotemia (an increased concentration of compounds that impair the kidneys’ ability to filter and eliminate waste) in cats and dogs.Azodyl is a nutritional supplement that reduces azotemia (an increased concentration of compounds that impair the kidneys’ ability to filter and eliminate waste) in cats and dogs. Azodyl is a patented formulation of naturally-occurring beneficial bacteria that metabolizes and flushes out uremic toxins that have diffused into the bowel. It supports kidney function by providing natural enteric dialysis and slows down uremic toxin buildup in the blood to help prevent further kidney damage. This medication is for animal use in dogs and cats only. The capsule should be given whole and not opened or crushed. Allow free access to fresh water during administration. Administration can be for the life of the animal.